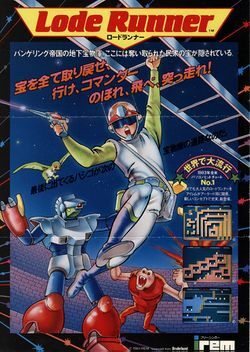 In 1984, Irem developed an arcade conversion of Lode Runner which contained 24 selected levels from the 150 original levels. In addition to adding a lot of detail and animation to the traditionally simple graphics of the game, Irem expanded the game play by hiding enemies in certain blocks which, if uncovered, join in the fight against the player. Bonus points can be earned for landing on enemies' heads.